The Watson Headache® Approach is not just a series of techniques. It is a "precise, elegant, systematic and measurable protocol". 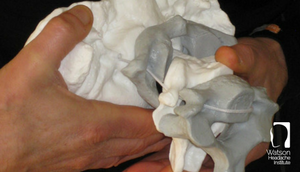 skilled assessment and management of their upper cervical spine". h) 3 - 6 months since attending the Level 2 Consolidtion Course. 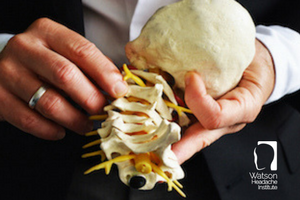 So that we can support you, should you have any queries about any of the outlined points in these documents please forward a separate email advising this to jane[@]watsonheadache.com. The first requirement is to complete a ‘Headache Journal’, which is record of your assessment and treatment of 5 headache patients. This is mandatory part of the examination process. During the course you will be required to assess a patient in 60’. Fifteen minutes prior to the subsequent examination of your patient (40’ duration) to present your interpretation of the initial consult and treatment to the group. Your presentation needs to be clear and effective summary - the pertinent points only. Note that assessment of this component is about your content and not mode of presentation. A theory paper (part multiple choice) and examination of techniques, which will also include a viva. 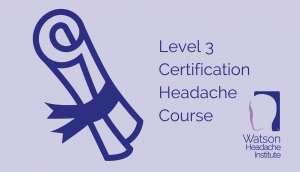 Upon completion of the Level 3 Certification Course, a practitioner should be able to care for routine and complex headache patients of all types and should be competent in the physical techniques, clinical reasoning and patient communication (education and coaching). You will receive a Certificate of Attendance at the conclusion of this course and this will enable you to promote yourself as having attended the Watson Headache® Level 3 Certification Course. The Watson Headache® Institute directs you in this regard, using the ‘Marketing Permission Given to Course Attendees’, acknowledging the Watson Headache® Institute's intellectual property (including trademarks) and copyright rights. You do not have permission to create a title for yourself using the words Watson/WatsonHeadache®. 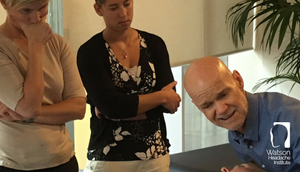 the many people with headache and/or migraine who have sought the help of health professionals (physiotherapists, chiropractors, osteopaths and manual therapy doctors) who have attended one or more of the Watson Headache® Institute’s courses. We hope you can join us on this course or a course in the near future. The Watson Headache® Institute’s courses fill quickly so register now to avoid disappointment. You can take advantage of the following Payment Options if you have previously expressed interest in the Level 3 Certification Course or register within the advised time lines.